February 15, 2015 May 8, 2015 | C.S. Young Jr.
With increased agricultural production in the late 19th to early 20 centuries, the need to store and process local grain production led to the development and implementation of grain silos with internal grain elevators for transporting grain to the top of the structure. Grain or other organic materials would fall through into the silo on top of existing grain and create layers of compressed material. The grain silos in this image are typical of silos built in the first half of the 20th century. February 12, 2015 May 8, 2015 | C.S. Young Jr. 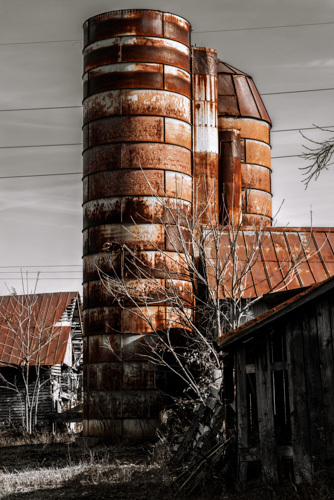 The first series of posts in this blog will be from one of my favorite portfolio galleries — Rustic Southern Barns. Today’s post, also includes an image from Jordan Farm. Just into an excursion inside one of the many barns on the farm, I found this fork & bucket. It immediately made me feel like I had just missed the individual who left it there, perhaps upon completion of a recent chore. This simple but strong composition with the wood slightly converging lines of wood siding crossed perpendicularly by the fork, wood grain textures and empty bucket caught my eye. During processing of the DNG image, I took care to retain just a slight bit of detail inside the bucket, outside the bucket and in the top corner of shadowed wood. On both my Samsung S5 Super AMOLED and iPad Mini Retina, I was disappointed neither display held the detail inside the bucket. A slight amount of burning was needed around the hay. Thus far I’ve gravitated towards processing most of my black & white images with Alien Skin’s Exposure software Kodak Panatomic X film filter with a few modifications. I push the processing setting about 1 stop to get just a little extra contrast and provide a small amount of boost in the darkest shadows. As a fine grain b&w film, the Panatomic filter offers a subtle grain structure to give the photo a nice “analog” feel. Back in the 80’s when I shot a lot of B&W film, it was mostly Tri-X and Plus-X. Panatomic was too slow, more expensive and hard to find in 35mm. I have several additional images with commentary from Jordan Farm & Rustic Southern Barns to share. Please stay tuned and let me know if you have any questions about my techniques. February 11, 2015 May 8, 2015 | C.S. Young Jr. This inaugural post introduces my fine art photography blog. To start things out, I thought my recent visit to Jordan Farms in High Point, NC (my hometown) would be a nice place to begin. 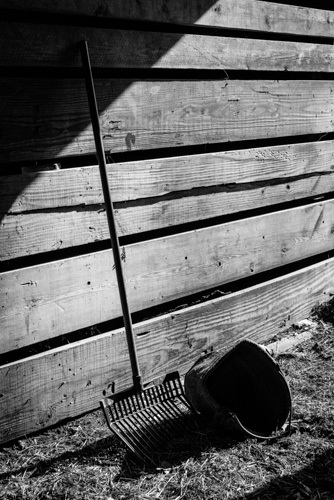 Like many vanishing farm homesteads, Jordan Farm represents an opportunity for the photographer to document the agricultural tradition and way of life while presenting to the viewer visually interesting & meaningful imagery. 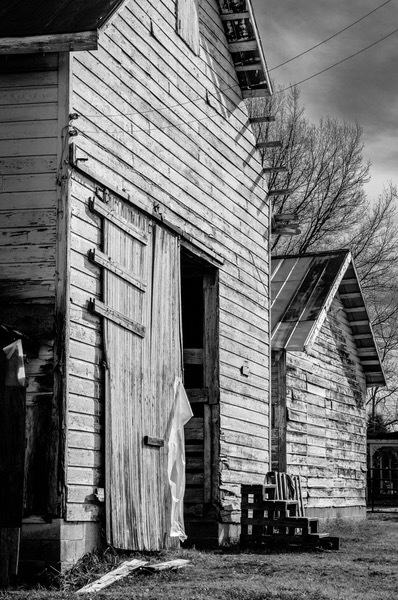 My first image is a barn facade in the large farm complex. I worked with the image in Lightroom to find the right contrast settings to emphasize the white facade while preserving visual interest elsewhere in the composition. As I’ll discuss more in future posts I love to use Alien Skin Exposure software to add some old school warmth to my imagery. I would love to hear your thought and feedback about my work. Also, please visit my portfolio site at csyjr.photoshelter.com. Hope you enjoy!